Why FlowGuard Gold® CPVC is the Sustainable Choice | Lubrizol Advanced Materials, Inc.
For builders and developers interested in developing sustainable homes and buildings, both design considerations and material selection can be important contributing factors. Unfortunately, some in the industry have adopted short-cuts, such as red-lists, to evaluating materials that can have the unintended consequence of making a building more harmful to the environment. Red-lists simply prohibit certain materials without full evaluation of the impacts of a material or consideration of alternatives. Despite the fact that this methodology has been often ridiculed, many otherwise respectable organizations continue to be influenced by this flawed approach – and are building less sustainably because of it. Selecting truly sustainable building products requires a science-based approach that involves reviewing hard data and evaluating alternatives. When it comes to your plumbing systems, a detailed scientific review proves that FlowGuard Gold® CPVC is the superior material for plumbers and builders who want to design and build sustainably. While many companies claim they offer sustainable products, without providing supporting evidence, our claims have been demonstrated through the rigors of an independent third-party certified Life Cycle Assessment (LCA). Lubrizol is committed to providing accurate, transparent information about our products, including FlowGuard Gold CPVC, which is why we completed the pipe industry’s first LCA, which is third-party verified and conforms to ISO 14040 and 14044 Standards. The LCA outlines the environmental impact of FlowGuard Gold piping systems from cradle to grave and allows specifiers to earn LEED credits. The data from the LCA can then be compared with similar information on other materials. FlowGuard Gold piping and fittings received the Home Innovation NGBS Green Certification, with FlowGuard Gold pipe and fittings being the only residential plumbing pipe system earning this distinction. Using FlowGuard Gold CPVC results in points awarded toward project certification under the ICC-700 National Green Building Standard. FlowGuard Gold CPVC has been independently verified as an eligible product due to improved environmental impact measures by an average of 15% or greater. Learn more about the results of the LCA and how to apply the documentation to your project. While an LCA is a huge step in environmental transparency and contributes to certification through both the LEED and NGBS rating systems, it leaves the burden of product comparison on the builder or engineer. Fortunately, the NIST BEES Online (Building for Environmental and Economic Sustainability) software is another resource that compares the environmental impact of building products by using the life-cycle assessment approach specified by ISO 14040. The measurement analyzes all stages in the life of a product, including raw material acquisition, manufacturing, transportation, installation, use, and recycling and waste management. 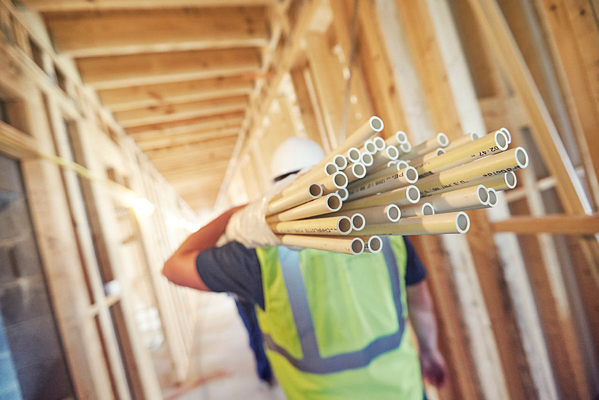 Users can compare CPVC and PEX under the “Domestic Water Distribution” category, with users able to select materials based on house size and whether hot water usage will be clustered or spread out throughout the day (“cold start”). Users may also customize the environmental impacts based on the transportation distance from the manufacturer to the house location. The chart below provides an ISO compliant comparison of CPVC and PEX in a large house with a clustered use pattern and the same transportation distance. The comparison confirms that CPVC is superior to PEX in 10 out of 11 measured categories. With many companies presently claiming they offer sustainable piping systems, it is essential to take a science-based approach and evaluate hard data when comparing piping systems for sustainability. Lubrizol offers accurate, transparent information about FlowGuard Gold CPVC piping, with FlowGuard Gold CPVC the superior choice for designers and builders interested in constructing sustainable homes. FlowGuard Gold CPVC is America’s oldest and most proven non-metallic piping system, with only FlowGuard Gold CPVC offering the assurance and consistency of product that comes from being made with resins and compounds produced in the same plant under Lubrizol’s control in Louisville, Kentucky. With 60 years of proven history, more than 11 billion feet of FlowGuard Gold CPVC have been installed in American homes and businesses.